Diamond/Pearl The shell is hardened soil. Some Pok�mon come to peck the berries growing on the trees on its back. Platinum It knows where pure water wells up. It carries fellow Pok�mon there on its back. 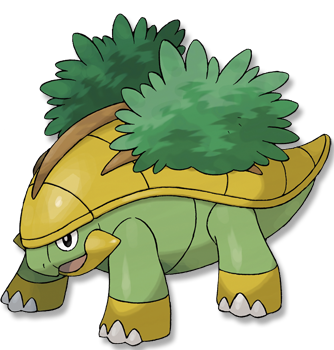 Heart Gold A GROTLE that lives in the forest is said to have its own secret springwater. Soul Silver A GROTLE that lives in the forest is said to have its own secret springwater. Black It knows where pure water wells up. It carries fellow Pok�mon there on its back. White It knows where pure water wells up. It carries fellow Pok�mon there on its back.